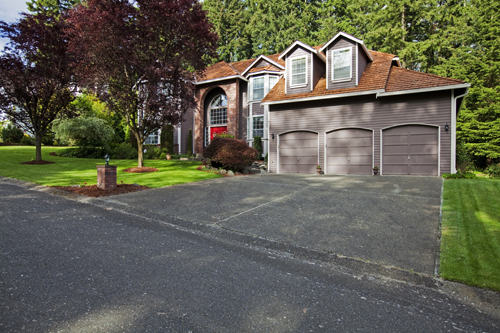 To comply with the current safety standards, all garage door openers are required to have a set of two safety sensors, which sit on the two sides of the door at a small distance above the floor. When they malfunction, the door will keep reversing and will close only if you keep holding the wall button. Don’t put up with this situation, but let us, at “Garage Door Repair Camarillo”, fix the problem quickly and effectively. Our local emergency service is quick and reliable. If the devices don’t get power, we’ll check and replace the wiring. If the sensors have failed, count on us to change them without delay. They will be secured accurately and adjusted to work with the opener. There aren’t many things which can go wrong with a spring, but all problems with these components are quite serious and require fast solution. If the door takes longer to open and is difficult to keep closed, the torsion spring may be out of balance. Our local company in Camarillo is always available to help in this and similar situations. If our test confirms the problem, we’ll adjust the component with winding or unwinding to increase or decrease the amount of force which it holds. If an extension spring has a stretched coil, let us change it timely to prevent damage to the lift cables, pulleys and other components. A broken spring will leave the door stuck completely. Rely on us to replace it straight away. You will always get quick professional assistance with our local garage door repair services.